When New Metal appeared some years ago (sorry, but I refuse to write “Nu”, because I hate to use wrong writings, and “nu” in my mother language means “naked” in a manly conception), it was a fever among the younger Metal fans. But as all trends, it became little again, what doesn’t meant that it disappeared. Many new names still appears in this genre, and the quartet NANCYBREATHING is one of them, unleashing a violent musical work on “Awake”. I hope that you all know that New Metal is made of contrast between melodic and deeper moments with some melancholy, and violent and screamed parts. It’s a normal feature of the genre, and these guys really know what they are doing. Let me tell you: they play in a violent and modern form, using those electronic elements that New Metal inherited from Industrial Rock that really sounds very good to our ears, even being distant from being something new. They aren’t creating something new, but they are pretty good, and their music has personality. On the sound quality of “Awake” is their secret: to use this modern and clean approach is what gives them the power necessary for their musical work. It’s truly aggressive and built with nasty low tuned tunes, but worked in a way that sounds clean to our ears and minds. On this contrast, we can understand and absorb their work without complaints. On the other hand is their music that was composed in a very good way. Their melodies are excellent, their aggressive parts are very good as well, and just a bit more maturing will make them great. For now, songs as the heavy and greasy “Awake”, the very good tempos changes and breakdowns of “World on Fire” and “Too Many” (these ones are filled with fine guitar riffs), the charming modern melodies of “Inner Emptyness” (charming melodic moments that will seduces you), and the savage ones “Broken Dreams” and “Groundhog Day” with their abrasive harmonies will make your day. 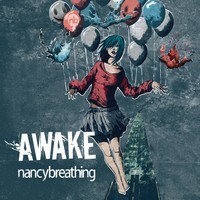 NANCYBREATHING is a good name from this New Metal generation, so listen to “Awake” out loud, and you’ll love it.